I love this book (published 2003); I think it conveys better than any other I know an essential message for schooling today: that quality student work matters, that we can teach for it and expect it and recognize it, and that as much as process matters, product matters equally. So much energy is being expended on measuring student achievement quantitatively, and this blogger is on record endorsing quantitative measurements (but the right ones! ), but we also need to embrace the qualitative too. In the past year I have read nearly 50 books on contemporary schooling, and this is one of the very best in that set. Berger teaches 5th grade, and so I fear that some might dismiss his counsel as being only suited for elementary schools, but that would be a big mistake. Secondary schooling needs to make a much bigger commitment to challenging and supporting students to do truly excellent, finished work, and to display and publish it widely. Sizer has taught us that exhibitions matter, that students should be being prepared to present some final demonstration of their learning for secondary graduation, but I think the method must be broader than just a summation: throughout our students’ schooling they should be presenting and publishing polished work. At the K-8 school I headed for nine years, the faculty prided itself, rightly, for the amazing work they guided their students to accomplish, and on every tour I led, I was told by visitors that no other school they had seen displayed so beautifully such fine student work. At Saklan, and I take no credit for this, each classroom had two, three, four bulletin boards featuring excellent student work: always, I should add, everybody‘s work. (I am not advocating, and neither does Berger, that we display only the best student’s work in some blue ribbon showcase. ) But rarely, very rarely, among the 20 high schools I visited in fall 2008, however, did I ever see quality student work on display. Important to me also, as I read Berger, is that it is a progressive educator that he prizes excellent craftsmanship so greatly. I fear that some very fine progressive teachers place too great an emphasis on process, and disparage finely finished student work as somehow out-of-place in a learning environment. I debated this point long and hard one school year with an excellent teacher whose personal connection to kids and whose success at teaching critical thinking were superb. But the bulletin boards were blank; the work students completed was sloppy and unimpressive; the oral reports simply a sprawling, unrehearsed mess. She and I argued; she said that she didn’t think class time was well spent having students bring their thoughtful learning activities to a polished conclusion, I said it was essential that they do so. She said her emphasis was process; I said my goal was the reconciliation of process and product. I am glad, now, to have a progressive ally like Berger in my corner; I wish I had him then. 1. In the classroom, or on the building site [as a carpenter], my passion is the same: If you’re going to do something, I believe, you should do it well. You should sweat over it and make sure it’s strong and accurate and beautiful and you should be proud of it. 2. I want students whose work is strong and accurate and beautiful; [I want] students who are proud of what they do, proud of how they respect both themselves and others. 3. I believe that work of excellence is transformational. Once a student sees that he or she is capable of excellence, that student is never quite the same. 4. We honor children with a great deal of responsibility and we expect them to live up to this honor. Rather than seeing school as something being done to them, students are given the responsibility to carry out original academic projects, save work in portfolios, and reflect publicly on their work and their learning. They present their work regularly in school assemblies and in exhibitions for the town community. 5. The project model at my school is predicated on every child succeeding. Not just finishing, but producing work that represents excellence for that child. Though some of the work is done as homework, the classroom is the hub of creation, the project workshop. 6. Every final draft my students complete is done for an outside audience. It may be for a small audience of Kindergarten children or for a national audience on educational television. Either way, my role as teacher is not as the sole judge of their work, but rather similar to that of a sports coach or play director: I am helping them to get their work ready for the public eye. There is a reason to do the work well, and it’s not just because the teacher wants it that way. 8. Imagine if students and schools were judged instead [of on standardized testing] on the quality of student work, thinking, and character. Imagine an expectation that an adult should be able to enter a school and expect that any child would be ready to greet him politely, give an articulate tour of a well-maintained courteous school environment, and present his portfolio of academic accomplishments clearly and insightfully, and that the student’s portfolio would contain original, high quality work and document appropriate skill levels. For the quotes I have singled out the succinct, the compelling, the rhetorical. The book has though also many stories, and many practical tips; it is not just rhetoric. It comes from the heart too: straight from Berger’s own classroom, from his own teaching and practicing what he preaches. I think many of us worry that project-based learning, or progressive education in general, carries too much the connotations of a certain degree of sloppiness. We fear it is perceived as just about kids experimenting and trying things and getting their hands dirty. This is the importance of Berger’s message: learning should be experiential and it can be messy in the making, but central to the learning experience has to be a completion and a product that is anything but messy, but something that will make everyone proud. My thanks to Kyle Hartung at Envision Schools for recommending this fine book to me. I should also give a shout-out to an amazing teacher with whom I worked for nine years. 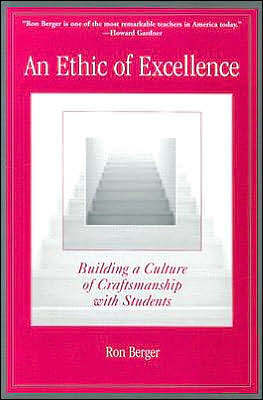 She and I didn’t always see entirely eye-to-eye on everything, but she daily demonstrated a teaching practice of excellence very much parallel to Berger’s “culture of craftsmanship with students.” Long before reading Berger’s book, I learned the value of this approach and this method from observing the teaching of Carol Schofield in the 2nd grade classroom at Saklan Valley School. Ron Berger’s book is also one of my all-time favorites, and one that I passed out to all our department chairs a few years back. I also had the privilege of sitting with Ron a couple of times (including once when he was the presenting teacher) at Rounds at Project Zero, Steve Seidel’s extraordinary monthly experience for educators at Harvard. Anyone finding him or herself in Boston on the first Saturday of a month during the school year should definitely check this out. I think that what prevents AN ETHIC OF EXCELLENCE from going viral is that it calls on teachers to embrace that ethic in their own work as we build the ethic into the learning experiences we create for children–one more reminder that doing education really well is supremely hard work.